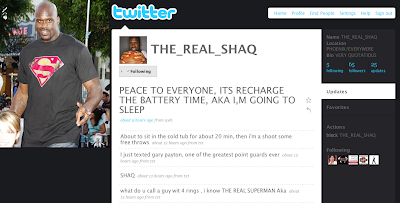 I signed up to follow Shaq's Twitter. I was skeptical at first whether or not it was really him. I'm waiting for the Twitter of The Real Brian Scalabrine. Thanks for finding this Alana! Sixty five followers seems like so long ago, eh? i kno i aint famous but id like mo ppl ta twitta me. not 2 many tho cuz aint on all day ya kno.